You cannot go past Limo Hire Melbourne for Wedding Car Hire, Formals Debs, Wine Tours, Golf Tours, Hens and Bucks Birthdays Anniversaries Proposals Concerts Sporting Events and Special Occasion Limo Hire. Our range of limousines through to 12 seat stretch limos offer smoke machines, laser lights, starlit ceilings, mood and neon lighting, iPod connectivity and DVD screens our cars are customed for your entertainment and enjoyment. Our chauffeurs are professionally trained, clean shaven and immaculately attired in a suit we offer the highest standards of service. We are at your disposal to make your event most memorable. At Limousine Hire Melbourne our cars are unique! Built here in Melbourne to Australian Design standards they have state of the art fit out and state of the art construction in their design and safety. 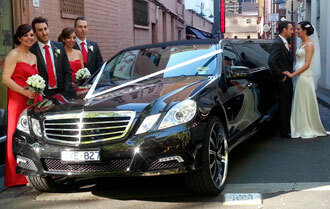 They are the best limousines Melbourne has to offer. Go to our vehicle specifications page to see why! We provide a free upgrade to one of our 12 seat limousines whenever we have one available! If you book a 6, 8 or 10 seat stretch with us outside of peak times you are more than likely to end up in one of our magnificent 12 seat Chrysler 300C or Ford G6E stretches.